Find ideas to transform your home on every page. Sleek by Asian Paints is the pioneer in modular kitchens in India, delighting customers for over 25 years. We understand your every need, and design your dream kitchen with world class designs handpicked for you. We are present all over India to help you design and realize the kitchen and wardrobe of your dreams. Sleek Kitchens are made in our own world class manufacturing facility, and are precise to the last millimetre to give a seamless finish. Our factory-fitted kitchens come pre-drilled, making the installation hassle-free. Our Kitchens are crafted out of the best quality materials and hardware selected from all over the world to suit your needs & decor style. Sleek’s durable kitchens come with a 10 year warranty. A Sleek Kitchen is a space for your entire family to cook, live and make memories that last for a lifetime. Our storage solutions and in-built appliances make cooking a breeze. The Sleek work triangle ensures that everything you need is within your reach. You can choose from a selection of over 200 finishes, specially handpicked for you. Sleek's comprehensive range of kitchen appliances ensure that cooking is a joyful experience, be it Dal Makhani, Avial, Pasta or a delightful cake. Everyone dreams of owning a beautiful and multifunctional kitchen, but planning one requires expertise, patience, and expert craftsmanship. 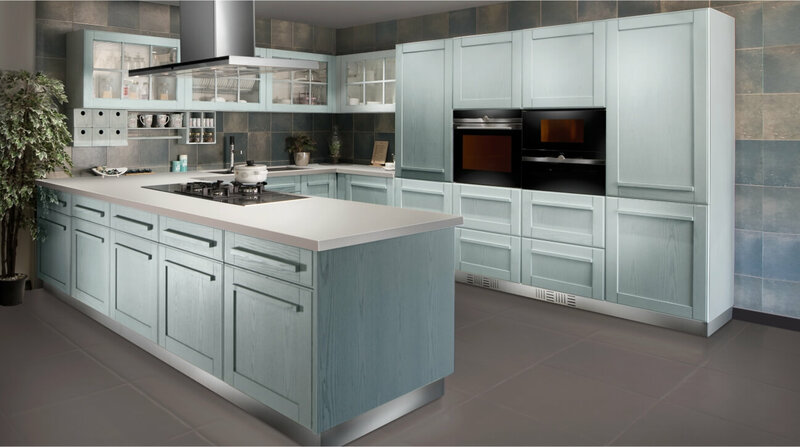 As kitchen specialists in India, Sleek is here to take the guesswork out of it for you. From multiple kitchen layouts to fit into rooms of all sizes to storage solutions, variety of materials and finishes, and top-of-the-line appliances, we take care of all the fine details that go into designing wholesome kitchens that are a perfect fit with your lifestyle, work demands, and budget. Our kitchens are beautiful and durable on the outside, and convenient and efficient on the inside. Whether you want to give your kitchen space a minimalist and modern look or hope to add a touch of high-tech elegance to your homestead, we have got you covered. Over 16000 happy families enjoy their Sleek kitchen everyday. Visit us today to join them and experience the convenience of a Sleek modular kitchen. Click here for a kitchen makeover.